You want smooth production flow till the end of an order. Right? Read this article to know how you can run your production floor smoothly. In garment sewing floor, most of the time production managers and line supervisors are found to be busy in fire fighting. In such work environment it is difficult to remembers what all things to be checked and to be delegated to your subordinates. Everyone work in the floor whether he is a helper, sewing operator, or engineer are responsible for some specific tasks. To achieve production target with quality and quantity you need to ensure that everyone is doing their jobs correctly and maintaining discipline on the shop floor. How do you keep an eye on their work? There is a solution. Use a checklist for routine tasks. A simple checklist plays a great roles to keep things on right place everyday. A checklist helps users to keep things on track. 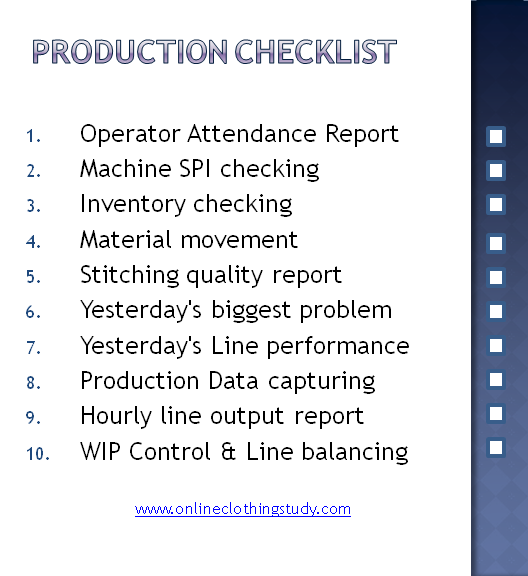 Here I have mentioned top 10 checklists for production team. Operator attendance report: Check operator attendance list. In place of absent operators allocate most suitable operator to keep production up from all workstations. Machine SPI checking: To be checked by operators when they start work in the morning. Inventory checking for enough cuttings, trims, machine spare parts: To ensure that in middle of the day no operator sits idle in the lines due to low inventory. Material movement are happening as per plan: You might use bundle system in your assembly line or single piece flow system. whatever it is, you need to check whether operators, helpers and supervisors are maintaining discipline in material movement. Stitching quality report and progress: Read feedback received from quality personnel on stitching quality and plan for action to be taken to reduce the issue. Yesterday's biggest problem related to production and quality: What action has been taken or need to take to solve the issues? Yesterday's Line performance: Line may go down in last production day due to various reasons. You have know the exact reason(s) and take action accordingly. All quality and production formats are in place: If you use formats to collect data and check whether all format are on write place and responsible person is collecting data following standard method. Hourly line output report: It not always possible to dig down into each operators to check individual production. From hourly output data you can see how line is performing. WIP control and Line balancing: Line balancing and WIP inside the line need to be controlled by line supervisors throughout the day. You may have different things in priority. Make your checklist accordingly. Download the above checklist template for your reference if you are not using any production checklist. What should you check as a production manager?